It's been baking for a year, LA Color Pros proud to release TakyBox V3. It's been a year baking . We are officially releasing TakyBox V3. 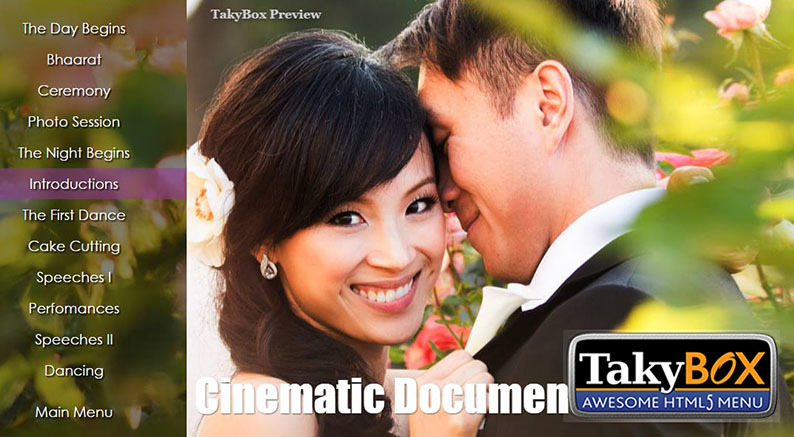 TakyBox is an HTML5 Menu for Event Filmmakers to deliver professional DVD style menu on USB drive or Online. The newly redesigned TakyBox Console is a web app in organizing your projects, add menu, buttons and linking easily. It supports multi-lingual display, loop feature for bridal show, one-click ZIP file export etc. TakyBox V3 also work with the TakyBox HDMI Stick (formerly known as the TakyDongle :) to playback films on any TV without the need to create DVD or BluRay. Add a new Button style. Total of 3 button styles to select form. Add text box overlay to menu screen. It allows adding additional message to the menu screen. Add share icon to share link of TakyBox project, YouTube or Vimeo video link. Revise license key process. It is now transparent to user. Consolidate all settings into one index.html file. Add Image Gallery to manage image file user uploaded. User upload the menu background image for deployment. Zip file download. No need to export individual menu or settings file. All in zip file export. Check it out and sign up for a FREE TRIAL today!